Fruit and vegetable prices have soared by 50 per cent plus in the past year after the wettest summer in a century devastated crops. 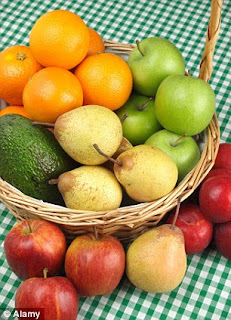 A snapshot survey of fresh produce costs reveals some startling increases, and supermarkets are warning of more to come. Grain prices are also surging because harvests both in the UK and abroad have been hit, which will put up the cost of bread and pasta. It has already led to dramatic increases in the cost of animal feed and this will have a knock-on effect on the price of milk, chicken, eggs, pork and bacon. The survey by the shopping and price comparison website MySupermarket.co.uk found that at Asda a 2.5kg pack of Maris Piper Potatoes has doubled in price from £1 to £2 since October 2011, while a pack of British Gala apples is up 70 per cent to £1.70. 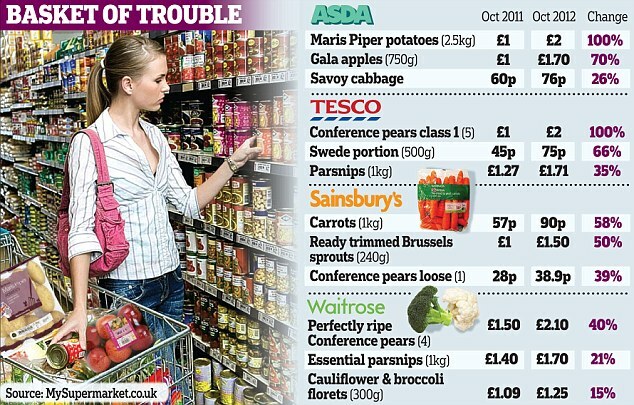 At Tesco, a kilo of loose carrots is up 50 per cent to 90p, while a 400g pack of cauliflower and broccoli florets is up 25 per cent to £1.25. Sainsbury’s has put up the price of its Conference pears by 39 per cent to around 39p each, while its loose Royal Gala apples are 19 per cent more. 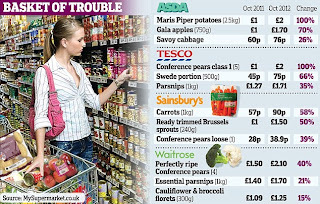 The Essentials range at Waitrose is designed for shoppers on a budget, but a 1kg pack of carrots is up 55 per cent in a year to 90p, while pointed spring cabbage has risen by 35 per cent to 80p. 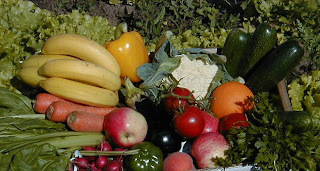 The price rises mean many people are not buying the fresh produce they need for a healthy diet. The poorest 10 per cent of households are buying 25 per cent less fruit than in 2007, while their vegetable consumption has fallen by 15 per cent, according to a study published by the Department for Environment, Food and Rural Affairs.Tim Lang, professor of food policy at London’s City University, said the surge in the price of fresh produce is ‘a disaster for public health’. The British Retail Consortium, which speaks for the major supermarkets, insists its members are protecting customers against the worst effect of rising prices. But bosses at Tesco and Sainsbury’s have warned of shortages of home-produced fruit and vegetables and higher prices in the run-up to Christmas. The problems for British farmers relate to the torrential rain during the summer months and more recently, which have left many fields waterlogged. The national potato harvest could be the lowest in 35 years, while the apple crop is down by around 25 per cent. 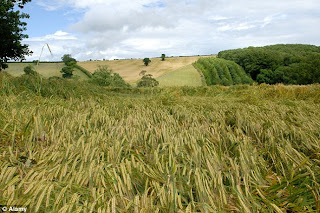 Farmers are also highlighting the fact that Britain’s wheat harvest has fallen by around 15 per cent this year on the five-year average, with productivity down to 1980s levels. While the problem in the UK has been too much rain, in the US and Russia droughts have hit wheat, soya, corn and other grains, pushing up the price of animal feed. The National Farmers’ Union has suggested that some members will pull out of chicken and pig production because the rise in feed costs mean they cannot make it pay. He added: ‘The challenge for the pig and poultry market is to make sure retailers pay a fair price, because in pigs 50 per cent of the cost is grain, poultry it’s 60 per cent. The extent of the washout is starkly illustrated by the decision of one of England’s leading wine producers to abandon its harvest. 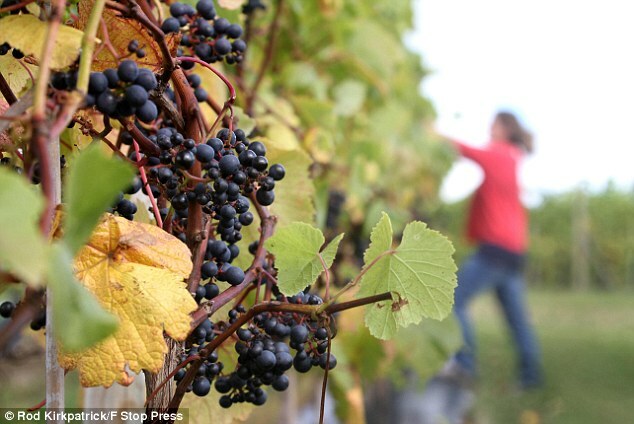 The wettest summer in England and Wales for 100 years means that for the first time since it planted its first vines in 1988, Nyetimber has decided its grapes are not worth collecting. Sparkling wines made by Nyetimber, which is based at West Chiltington in West Sussex, are popular with the Royal Family. The 2007 Classic Cuvee was the only sparkling wine served on the Royal Barge during the Diamond Jubilee pageant on the Thames and was also served at the Diamond Jubilee lunch at Westminster Hall.